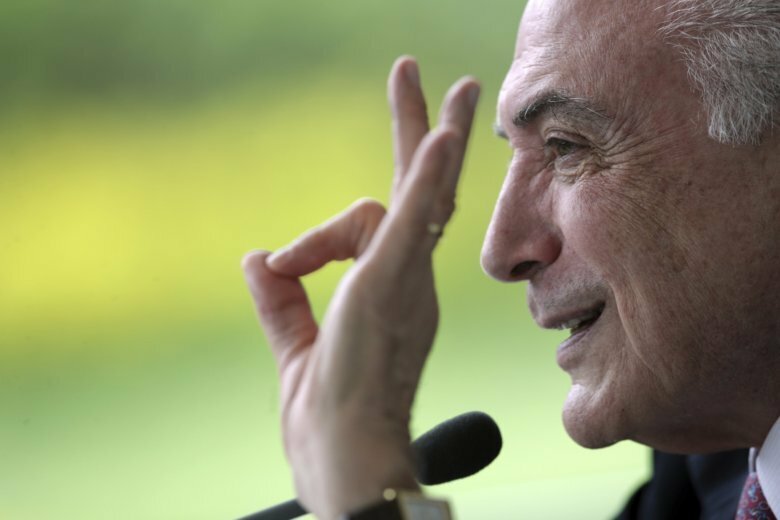 BRASILIA, Brazil (AP) — President Michel Temer said Thursday he was not worried about corruption charges that could lead to his being jailed after leaving office Jan. 1. In a meeting with foreign correspondents in the presidential residence in Brasilia, Temer said the cases were without merit, even if he said they nixed chances his administration could achieve major reforms, such as to the pension system. “I’m at ease. I don’t have the least bit of worry,” Temer said, adding he believed they would be thrown out. As a sitting president, Temer has partial immunity, which has helped him avoid criminal prosecution. Twice the lower Chamber of Deputies in Congress, which must weigh in on matters involving the president, voted against putting Temer on trial for charges leveled by the attorney general. When the 78-year-old leaves office, however, those cases will go to the normal court system. Over the last four years, numerous businessmen and politicians, including ex-President Luiz Inacio Lula da Silva, have been convicted and jailed amid a sprawling corruption investigation called “Car Wash.” The cases against Temer are connected to that larger probe, which focused on construction companies paying politicians for favors, often with money from inflated public works contracts. Legal observers believe the cases against Temer are strong and will likely move forward. In recent weeks, local news media have reported that Temer might be given an ambassadorship by the incoming administration of President-elect Jair Bolsonaro. Such a position would give Temer the partial immunity given to federal lawmakers, cabinet members and several other top officials. The law stipulates that only the nation’s top court, the Supreme Federal Tribunal, can decide whether to allow charges to go forward or put any particular official on trial, which in practice slows any prosecution. But granting such an appointment would be problematic for Bolsonaro, who ran on promises of “zero tolerance” for corruption. On Thursday, Temer said he “wouldn’t stop” being active and planned to take some time for himself. However, he declined to provide specifics, noting jokingly that he was older than 50 years old. Temer, a career politician famed for his ability to move bills through Congress, was serving as vice president when President Dilma Rousseff was impeached and ousted from office in 2016. Upon taking office, he cast himself as a reformer ready to help Latin America’s large nation emerge from its worst recession in decades. While his administration was beset with scandals — several ministers had to resign over corruption allegations in the first weeks — it did move Brazil forward on many fronts. A major reform to the labor code was passed, and in 2017, gross domestic product grew by 1 percent after contracting nearly 4 percent in each of the two previous years. “I think I will be remembered as someone who at least tried to get Brazil on track,” Temer said. “I will also be remembered as someone who did not worry about populism. Anybody worried about populism would not have done what I did” — an allusion to the unpopularity of his proposals to improve state finances by cutting guarantees for workers and slimming the pension system. Temer had publicly flirted with running for re-election this year despite approval ratings below 10 percent for most of his time in office. But his own corruption scandals didn’t just make that unrealistic and derail much of his agenda, they also threatened to jail him while in office. Last year, Temer was twice charged by Attorney General Rodrigo Janot in cases involving alleged bribery and obstruction of justice. He is also being investigated by federal police in a third case involving allegedly using bribes to pay for renovations on family property.